Having done it before, I thought I’d blog about plants some more, since I can’t think of anything more exciting to read about than someone else’s plants. This got me thinking, though… I don’t really do much with basil. I bought it mostly because it was $2.99 and it seemed fun, and Katherine convinced me it was a good idea. I think I’d much rather grow Rosemary or Peppermint or something. Garlic would be fun, even. 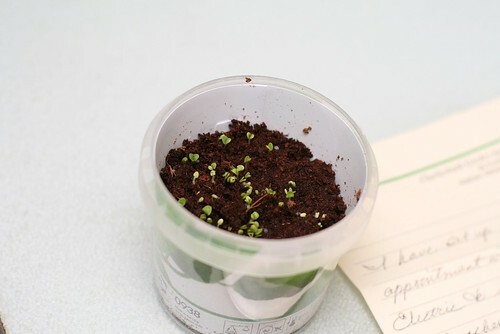 It also seems that basil gets big, so I’m not sure this little pot will hold it as it grows. This reminds me of a neat Lifehacker post, Three Plants that Give You Better Indoor Air. It seems to be suggested that you need crazy-person amounts of the plants to make a noticeable difference, but a few trips to Ikea (who knew they sold plants at all!?) have netted me a snake plant and an Areca palm, two of the three plants mentioned. (There are actually many more plants than those three that should work, though; check out Wikipedia’s List of air-filtering soil and plants). Another visit to Ikea got me a Norfolk Island Pine, maybe 9″ tall, just as an ornamental tree, not a natural air filter or oxygen-producer. Lifehacker mentions that rosemary and lavender both require minimal watering, making them somewhat hard to kill, which only adds to my inclination to grow rosemary instead of basil. It looks like rosemary is hard (but possible) to grow from seed, so they’re mostly propagated by cuttings, not seeds. As long as I’m citing Lifehacker about gardening, check out this neat post about growing something (e.g., moss) inside of a lightbulb as a DIY terrarium. Too bad most lightbulbs I have are frosted… Although it’s apparently possible to work around that. Here’s another page with tons of information on making your own terrariums. It’s easy to think of security as a negative action: keeping the bad guys out. A security guard is supposed to keep anyone bad from getting in, and question anyone suspicious. A firewall keeps out malicious network traffic. Anti-virus keeps bad software from running. Locks keep criminals and creeps from letting themselves in. But security isn’t just the “negative,” keeping bad things from happening, at least in my book. Sometimes paranoid, “negative” security leads to what I think of as a less-secure environment. The other day I almost got locked out of my apartment. I think I want to give some neighbors — who are friends I’ve known for years — a set of keys. From a paranoid/negative-security standpoint, this makes me less secure: it’s like opening another hole in the firewall, or adding another window to a secure building. But overall, the odds of a criminal getting into my home are only nominally increased, but the odds of me getting locked out would be greatly decreased. Security isn’t keeping the bad people out, it’s keeping the bad people out and letting the good people in. I’m also locked out of my work e-mail. Exchange (perhaps Active Directory) forces me to change my password periodically. Since I don’t use Windows, this manifests itself as me losing all access to Windows-based network resources until I can get a Windows admin to let me reset my password. [Aside: I think forced password changes are often counter-productive. I’m usually royally annoyed and choose something mediocre so I can quickly get back to work. This is where “password1” and then “password2” come from. No, my passwords aren’t that bad, but they’re not 30 characters of random symbols, either.] I also learned the hard way that several incorrect login attempts lock the account out. Ultimately, a security guard isn’t a zealot who shoots anyone who looks suspicious. He’s the guy who denies bad guys access, but who will use his master key to let you into your own place when you lock yourself out, provided he’s positive it’s really you and not your doppleganger. I realized a while ago that I didn’t really have a “dream computer” build in my mind, but a “dream network” with a few interconnected machines. I’m kind of thinking out loud with this configuration; input is welcome. I need a desktop. It’ll run Mac OS, but I can always boot into Windows when I need to. It’s got to have gobs of RAM, and I expect to have virtual machines running here and there. I’m going to want lots of storage, but it doesn’t have to be local. (More on this soon.) An SSD for boot and apps might be nice, though I figure it will stay running pretty often, so ample RAM might negate the need for this. I do want dual monitors. I want plenty of storage, and I really, really want everything to redundant, which implies that RAID is needed. Many motherboards these days do hardware RAID, so this shouldn’t be too hard. (I don’t need battery-backed cache or anything.) I think the easiest way to accomplish this is with a dedicated NAS machine. An Atom-based setup might work, though I’m not sure how many Atom motherboards have onboard RAID. I don’t have cable, and really don’t value TV at more than $10/month or so, which means that there is nothing I would pay for. But something like Boxee would support streaming from Hulu and such, and, frankly, looks really cool. I think the Boxee could sit on the same box as the NAS. The downside is that I want my desktop and the NAS connected via Gigabit Ethernet, since otherwise I’d be capped at 12.5 MB/sec. throughput. (Or, if I did wireless, even worse… 54 Mbps is a bit over 6 MB/sec.) The problem is that my TV and my desk are at opposite ends of the apartment, with no Ethernet run. So I’m not sure how I’m going to make that work. I’m not sure running Cat6 is an option. Fry’s has a refurbished HP p6177c desktop for $499.99. Q8200 quad-core (2.33 GHz), 8GB RAM, and a 1TB hard drive. Integrated graphics. It does have a DVD burner and slots for many common digital camera cards. Lifehacker has a roundup of a lot of deals that are even better than the Lifehacker ones I posted. The Nuvi 265WT GPS ($159.99, a $110 savings) also has a 4.3″ LCD, but adds live traffic feeds, and apparently acts as a Bluetooth speakerphone. The TomTom GO 630 is the 265WT’s rival, though it seems to lack traffic. $169.99, a $129.96 savings. Hitachi’s 2TB, 7200RPM SATA disk is $159.99 (a $10 savings), but there’s also a $30 mail-in rebate. Limit 5 per customer on the drives, not sure on the limits on the rebate. If you need size but not speed in your laptop, there’s a Western Digital 640GB notebook hard drive (SATA), 5400RPM with a measly 8MB cache, though. $89.99. Hanns-G has a 28″ LCD, 1920×1200, for $259.99, a $80 savings. With free shipping. I’ve been on the fence about buying TuneUp for a long time. On one hand, it’s a really neat way to fill in missing metadata and cover art for songs, and I have a lot of photos that need to be “tuned up” that way. On the other hand, it costs money and I’m frugal. If you buy TuneUp Gold now through the end of December 4th and use code “THANKSGIVING” at checkout, you save 20%. It’s normally $19.95 for a yearly subscription, of $29.95 for a lifetime subscription. There’s a free version good for 100 songs and 50 pieces of cover art, too. I’m buying it after Thanksgiving dinner. I admit it, I have an unhealthy obsession with typography. A really nice font can really be the difference between a blob of text and something really aesthetically pleasing and fun to read. I just found The League of Moveable Type. Be still, my beating heart. Only a handful, but they’re all great. The other great one is Font Squirrel, which remains discriminating but has a wider selection. So a number of my coworkers and I — not just our design guy — read Smashing Magazine pretty regularly. I doubt that 1% of my time focuses on design or usability, but I also think it’s something anyone working with the web ought to be comfortable with. Cross-training isn’t just useful because you can do someone else’s job; it’s useful because you understand what they do and what they need. I’d like to describe a new way of keeping the date. To simplify the current system, we’re going to wrap the day of the month at 16. So November 16 is “November 16, first-half,” and the next day, it’s “November 1, second-half,” because 17 would exceed the limit of 16, so you just start again at one and move to the second half. It’s a simple system, really: once we hit the 16th, we start over. If you have to convert to the old, antiquated system, the first-half numbers stay the same, and you just add 16 to the second-half numbers. Sure, there are some problems. If someone says it’s “November 7th,” you might not be sure if they mean first-half or second-half. I think the simplicity of not having to count past 16 really makes up for it, though. And it should usually be clear from context what you mean anyway. Okay, I can’t do it anymore. If you think the system I described is ludicrous, pointlessly confusing, and harder to use than just counting all the way up, I agree 100%. Except I’m really talking about 24-hour days, not 31-day months. After 12:59, who thought we should have 1:00? I used to think military time was silly, pointless, and confusing. But more recently, I came to realize that what’s actually confusing is the concept of restarting the counter after noon. There’s no magical distinction that occurs. After the twelfth hour comes the thirteenth. I don’t even think we need the military style, “Oh-seven-hundred hours” system. Have lunch at 12 o’clock. An hour later, go shopping at 13 o’clock. This seems really weird, but the more I think about it, the more I’m convinced that what’s actually weird is suddenly switching to a different numbering scheme that has all the numbers repeat twice. It doesn’t make sense to me, either, that analog clocks and watches go around twice. At noon, the minute hand should be pointing at the bottom. It’s measuring completion of the day, and the day is half over. We can leave analog watches and clocks alone, and treat them as archaic relics. But can we stop measuring time in a nonsensical manner?